Jg 7:22 And the three hundred blew the trumpets, and the LORD set every man's sword against his fellow, even throughout all the host: and the host fled to Bethshittah in Zererath, and to the border of Abelmeholah, unto Tabbath. We are building up to a very large, perhaps a world war in the Middle-East. It is centered on Syria, the nation northeast of Israel and east of Lebanon. That’s where Trump sent his missiles last week purportedly because of a chemical attack by Syria on its own people. This is where the west (including the U.S.) wants to build a pipeline that will bring Islamic oil and gas to Europe. A major reason for the pipeline is to provide alternate fuel for Europe and in the process cut deeply into the market of Russia who is at present the largest supplier of the Euro Zone. Syria, beholden to Russia for much of its technology and prosperity before the present war, and looking out for Russia’s interests, said “No thank you” to the pipeline proposal. The war then quickly began to overthrow Syria’s President. Sadly, America is once again on the side of the aggressors. We are trying to overthrow the Syrian government. Trump first announces we are getting out, then he turns around and sends missiles. Neither side will give ground. No one will back down. Will there be war? 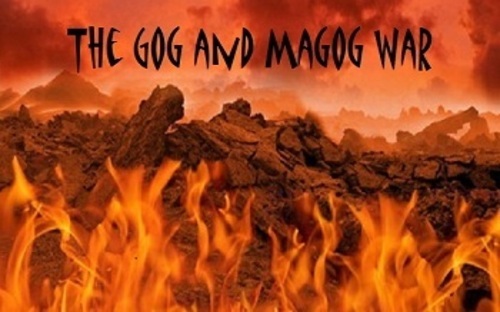 Yes, eventually a conflict, perhaps the present little war, will build up and at a tipping point explode into what the Bible calls the “Gog-Magog” war of Ezekiel 38,39. The Bible tells the whole story. It’s not complicated but your eyes will be dimmed and it may be hard to see if you are still at war with God by rejecting His Son. To understand today’s headlines we must study yesterday. Muhammad was Satan’s messenger on earth during the 8th Century in his founding of Islam and his followers are continuing his work today. How did this particular branch of the devil’s kingdom get started? The Bible gives us the complete story. In Genesis 15 (around 2000 B.C.) God promised Abram and Sarai (later Abraham and Sarah) a descendent to fulfill the promise to Abram to be the father of a great multitude. As time passed and no progeny was forthcoming, Sarai persuaded Abram to go into the Egyptian maid Hagar to father a son whom she believed herself physically incapable of producing. When Abram did as urged, Ishmael (the progenitor of Islam), was born. Thus Abram’s first son was born out of wedlock and therefore a son of the flesh rather than the son of promise. God then proceeded to forecast the future of this boy child who was the product of impatience. The prophesied insanity of Islam is shown in today’s headlines where Its unbridled hatred of “The people of the book (Jews and Christians),” plays out with the Satanic hatred of anything that smacks of the True God. Thus its adherents are willing to go to war and eagerly seek death as a “martyr for Allah” because they’ve been taught that’s the only sure way to buy a ticket into heaven. The Bible though calls it “salvation by works” as it stands in direct opposition to the biblical teaching that salvation is a gift that cannot be earned. The prime target of Islam is Christianity and they will kill thousands more (perhaps millions) before they are stopped. How will it end for Islam? 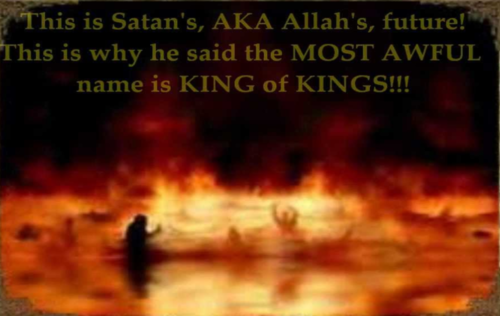 Read Revelation 6:14-17 and you will see how the mighty of this earth (which will include Islam) will cower in terror in caves and pray for death rather than face the One who sits on the throne on the great day of His return. Islam is on the wrong side of history. They have been spawned by the devil and will suffer the same fate as him, eternity in a lake of fire. 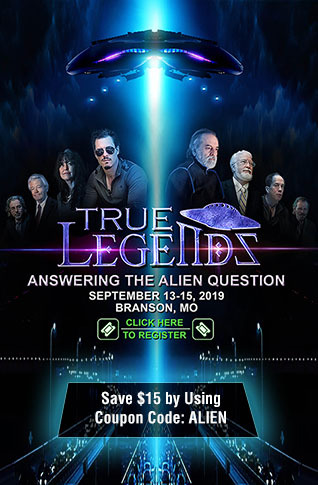 At the moment the One World bunch (who finances Islam) seems to be ahead and appear to be invincible in moving events for their own purposes. But that’s only temporary. One day with the swiftness of lightning, the deck will be turned upside down and what seems strong today will be shown to be as weak as a sick kitten. The final act that’s coming up will be shocking to behold. God will confound the minds of the soldiers of Islam and they will go insane while in battle. They will suddenly and seemingly without reason turn away from their war on Israel and instead declare war on themselves. It happened several times in Scripture and is prophesied to happen again in the battles yet to come. Here in just a few sentences the whole plan of action is given. 1Sa 14:16 ¶ And the watchmen of Saul in Gibeah of Benjamin looked; and, behold, the multitude melted away, and they went on beating down one another. 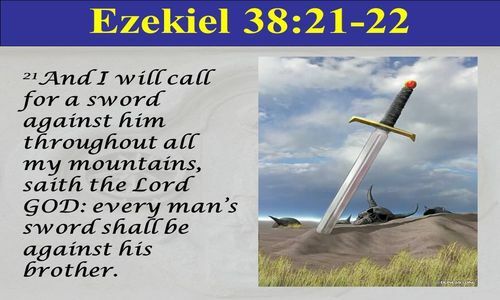 Eze 38:21 And I will call for a sword against him throughout all our mountains, saith the Lord GOD: every man's sword shall be against his brother. In summary we have discovered the origins of Islam, going back to the father of the Arabs (from which Islam came), who (they believe), have been cheated of their Abrahamic heritage by Isaac, Jacob and their descendents the Jews of today. That’s the excuse for their present insane hatred of anything that is even distantly related to Jewry and also the Christians because we are representative of the True God. We have also seen their future as they kill their own brothers and hide themselves in the rocks and caves and pray for deliverance from the face of Him who is called God Almighty. This is a cosmic battle. It is close to the culmination of history and if you want to know how it plays out you must study your Bible. As the poet Henley thought, so do the folks in the board-rooms, the “smokey bunch” behind closed doors who think they are executing the affairs of the world for their own advantage only to one day find they have conspired themselves into an unending existence in the lake of fire through their unbelief. The riches of this world are temporal and will soon vanish away, just as the wind does that lists through the trees. Unfortunately, most of the inhabitants of hell will be the rednecks who live next door, or in our own house. The ones we see at the grocery store, the ones we work with, even some of those we go to church with. Because, “being good” or “hating the new world order” won’t cut it. There is only one path to life and His name is Jesus. Unless something happens quickly to swerve us off our present course this world will soon be broken against the rocks of reality. The stock market is headed toward a crash, our present standard of living in America will soon be gone and war is looming on the horizon. Eternity is looking us in the face and sadly most of the world is totally unprepared for what we will soon meet head-on. Before long it will be too late to switch sides. Which side will you be on? 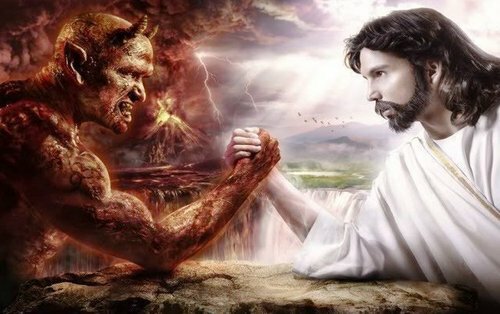 The winners (the born again) will live in heaven with God while the losers (those who trust in themselves or in “government”) will burn in hell.